He didn’t turn out tiny, and he didn’t turn out purty. He’s a poor thing, but mine own. I hope the ones that follow will be superior. If you want to try, here’s my pattern. If there’s any of this you don’t know how to do yet, do what I do and run whining to KnittingHelp.com. Cut yarn, leaving 6 inch tail. Using tapestry needle, run yarn through last stitch and then into the knitting and tie it off. this should leave a stubby little tail. Cut another length of yarn. using the tapestry needle, run it through stitches on the circumference of the knitting. Pull it closed like a drawstring and tie it off. If your guy comes out the way my guy did, you’ll have a ridge at one end. I used that as the front of the shell. The front feet need to be placed just behind that ridge, with the back feet a few stitches back from them. The head, of course, is at the opposite end from the tail! Finish off, as you did for the tail. Finish off. You might want to stuff him. You might need to tighten up or sew closed that underside. I’m thinking of cutting a piece of felt and sewing it on. I hope your guy comes out looking better than my guy did, but I’m proud of him, even though he is kind of raggedy. A WRITING PROMPT FOR YOU: A character loves something he or she has made, even though it’s seriously flawed. Steampunkers, I’m lookin’ at YOU. This entry was posted in Knitting. 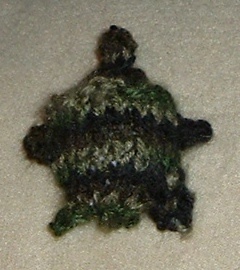 Tagged pattern, turtle.